For students at Ocean Knoll Elementary School in Encinitas, farming is part of the curriculum. They have a garden, they plant it, they tend it, they harvest it and then they cook up the produce, serve it and enjoy it. It’s all part of the healthy benefits of being a pilot school in the Sage Garden Project, a hands-on program of gardening and nutritional science for kindergarten through sixth grade. The project is one program of The Anthony Cerami and Ann Dunne Foundation for World Health. Its aim is to reduce youth obesity and Type 2 diabetes by providing the tools and inspiration for a lifetime of health. Because of the success of the pilot at Ocean Knoll, other schools are being invited to apply for grants of $5,000 to $50,000, funds that can help their garden projects grow. Ten awards will be granted by the foundation to elementary schools in California, said Dawn Mayeda, Sage Garden Project program director. The deadline for applications is April 30, 2015. Fund disbursements will be for the 2015-2016 school year. Applicants should have an active PTA and volunteers willing to assist along with the ability to carve out time during the school day for the curriculum. And schools that have Title One designation or a large minority population are encouraged to apply, as the foundation is focused on diabetes prevention. Some ethnic groups have a higher incidence of diabetes from genetic factors, according to Mayeda. The project benefactor, Cerami, is a research scientist who helped invent the hemoglobin A1c test kit for diabetes. “His wish is to stop diabetes before it starts not diagnose it once it has started,” Mayeda explained. Annie Dunne — his wife and co-benefactor — is an artist who formerly led a cooking school in Tuscany. The grant provides funding for an instructor to oversee the garden who understands agricultural science. Lessons and materials are included. The instructor will be trained at the Edible Schoolyard Academy in Berkeley in June, and the school will receive a rolling cooking cart. As a result of the program, Ocean Knoll students are willing to go beyond their comfort zone in making healthy food choices. “It’s unbelievable to see what these kids will eat,” commented Mayeda. Case in point is a recent field trip to A. R. Valentien, a premier restaurant at The Lodge at Torrey Pines. Six students were videotaped enjoying a four-course meal prepared by executive chef Jeff Jackson. Principal Jennifer Bond said, “It is surprising to see students eat vegetables that they normally would think are gross — like beets and bok choy — and actually like them. “Even if it is something they end up not liking, they are open to trying it. You no longer hear students say, ‘Ew, that is gross,’” she joked. Given the proper tools and instruction, projects like this one can lay important groundwork for children to become responsible future stewards of the planet, said Sullivan. They also appreciate the hard work that goes into growing produce and preparing it for meals, Sullivan commented. 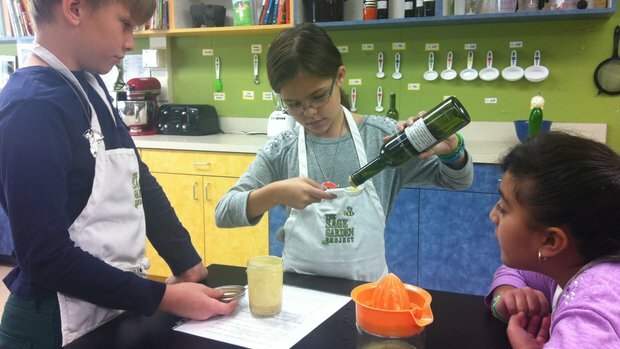 “Interweaving the lessons with what the kids are learning in science, mathematics and social studies brings everything together in a tangible way, where they can use all their senses to learn invaluable skills,” she added.